You may still be able to book by calling the hotel at 919-941-6000. Hilton Raleigh-Durham Airport at Research Triangle Park might be a long name for a hotel, but it's worth the breath. 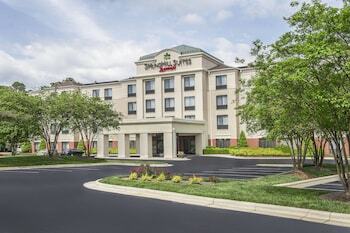 Located just a few short miles from Raleigh-Durham International, this hotel is perfect for business travelers looking for a convenient location and a hassle-free stay. Some of the world's most recognized companies, including IBM, Bank of America and Cisco Systems, have offices in Research Triangle Park, so you won't have to travel far to catch that early-morning meeting. 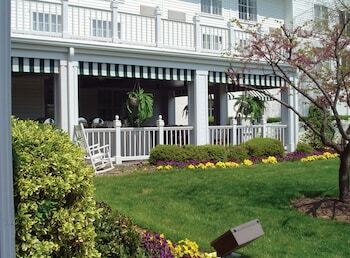 The hotel has many unique features such as a grand veranda, wicker rocking chairs and porch swings, which have earned it the nickname “The Mansion on the Hill,” while services like the 24-hour business center and the on-site fitness center ensure the utmost in convenience. Even though you'll be visiting Durham on business, a stay at the Hilton Raleigh-Durham Airport at Research Triangle Park will make you feel like you've also squeezed in a vacation. DoubleTree Raleigh Durham Airport at Research Triangle Park is a 3.5-star hotel located at 4810 Page Creek Ln, Durham, NC 27703, US . Its nightly price usually falls between $84.6 per night and $307 per night, excluding tax, depending on room category. $85 per night found for a Room, 1 King Bed, Non Smoking room type. DoubleTree Raleigh Durham Airport at Research Triangle Park sells rooms through sites like Room 77, Expedia, Hotels.com, GetARoom, and many others. Room 77 searches across dozens of different sites to find the lowest discount rates available. The lowest rate we've seen over the last few weeks was found on Room 77. In 1% of the cases we surveyed, all sites offered the same rate. You can compare real-time rates from all of these sites on Room 77. Room 77 is the only hotel shopping site that includes special discounts like AAA, senior, government, military, and corporate rates.